“Working with Victoria was one of my favorite experiences of my whole wedding planning process. She really took the time to get to know me and my personal style (and she's just a BLAST to hang out with). She made an effort to connect with all my wedding vendors to ensure that every little detail flowed seamlessly with the wedding design concept. I love the fact that Victoria wants each of her weddings to be unique. She told me, "no one else will ever have this," and it was the truth. She is truly a stationary wizard. She took all of my late-night thoughts and crazy wishes and brought them to reality. My guests are still talking about the beautiful additions she created (I mean...a black and white striped menu in Italian!?!). I loved her work so much that I also enlisted her expertise in creating my wedding shower and bachelorette invitations. When I got engaged, I didn't put much thought into the wedding stationary. 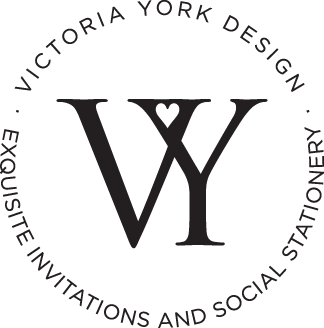 After my initial meeting with Victoria, I was a firm believer that stationary is one of the most important parts to creating a beautiful and memorable wedding. Victoria's work tied my whole wedding together. I was a able to make a bold first impression to my guests with the invitation and then let them see how the whole evening was tied together with a common theme. I cannot thank her enough for all her contributions to the biggest day of my life!"